As I walked up the Crawford Street in Marylebone, London, towards the new Perfumer H store, I must admit that I had a fair few butterflies in my stomach. I’m a nervous person at the best of times, but I was especially so on this occasion because I was on my way to meet Lyn Harris, the nose that puts the ‘Perfumer’ and the ‘H’ into Perfumer H. Harris’ CV precedes her, having built the hugely successful fragrance house, Miller Harris, from scratch in her early twenties, to the global lifestyle brand that it is today, Harris has a knack for making unfussy perfumes with a spirit of clarity. This spirit is not lost in Perfumer H however, it is presented in an entirely different way. 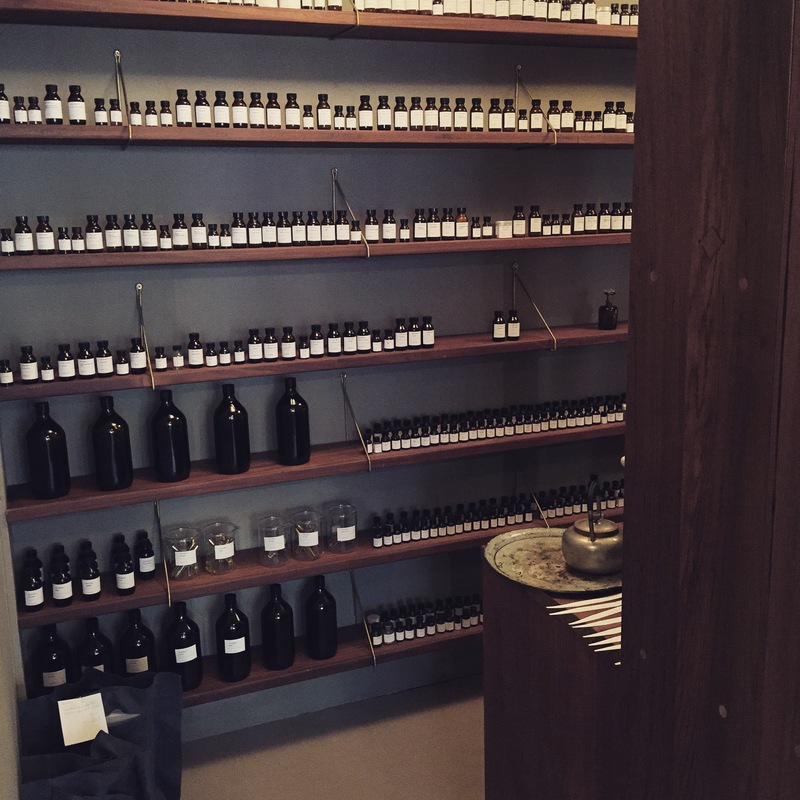 Stepping across the threshold of Perfumer H, I needn’t have been worried or been nervous at all, as the whole experience was an entirely relaxed affair, from the setup of the shop to the rather insightful chat I had with Harris herself over a cup of hot bergamot tea. As I enter the store, I’m greeted by a dog snoozing calmly on the chair. His name is Pop and he’s a handsome border terrier who, quite rightly, appears rather at home amongst the inviting, yet surprisingly minimal decor of the store. The presence of Pop cements the fact that Perfumer H is not a brand in the typical sense, with a pre-defined personality or ethos. Instead, Perfumer H is an extension of Lyn Harris, and its personality is Lyn as she is today, and it says what she wants to say, all through the medium of olfaction. What strikes me as refreshing about Perfumer H is just how organically it grew together as a concept. Lyn Harris told me that, after leaving Miller Harris, she took some time to work on bespoke fragrances for her private clients with no real intention of hopping back into the perfume biz or to open up another brand. Having undertaken some bespoke work, Harris decided that she needed a bottle to house her creations in, a thought that led her to the glassblower Michael Ruh. Working with Ruh, Harris spent over a year perfecting her flacon, a striking handblown glass jar with an icicle-like glass stopper. It was the varying hues of these bottles that inspired the idea to create seasonal fragrances in each of the five main fragrance families. Working with no timeline and no pressure, Harris started to engineer a brand, without really setting out to do so. At the same time she undertook a decluttering exercise of the olfactory materials in her library, a process which she says brought “a new wisdom and strength into my work”. Working in this way appears to have been refreshing for the perfumer and it is her partnerships with craftspeople, including Michael Ruh, the glassblower, Studio Frith who worked on the packaging, and designers Retrouvious, who have created the Perfumer H space, in which Harris works, that has shaped one of the most unique and intriguing brands to appear in British perfumery for a long while. Harris’ atelier is a unique one. It doesn’t house just a shop for her to sell her wares, it also boasts a laboratory too, in which the formulas are mixed up and the perfumes are bottled to be sold. The first thing one sees when walking through the door is the lab, which is nestled at the back of the studio, but is in plain sight for all to see. “I wanted to bring an element of visibility here and for people to experience the surroundings of a perfumer” says Harris, and it’s clear that her intention was to demystify the often secretive and exclusive process of crafting perfume. By showing the work of a perfumer so clearly, Harris has marked Perfumer H as an inviting place that values accessibility over the perfume industry’s favourite, and default modes of snobbery and exclusivity. The main focus of Perfumer H is a central collection of five fragrances. Twice a year, Lyn Harris will refresh this collection to create a seasonal wardrobe of scent that is split amongst the five main fragrance families (citrus, floral, wood, oriental and fern). For Winter 2015, the current collection paints a varied picture of Lyn Harris’ signature style of uncluttered scent. All five perfumes have a paired-back subtlety and softness to them that feels undeniably intimate, and whilst none of them smell the same, they all feel part of one cohesive collection. I like to think of them as the fragrant equivalent of five key pieces in your wardrobe, and much like clothing, these olfactory creations speak in the languages of colour, texture and emotion. When I think of the many fragrances released by Miller Harris, Lyn Harris’ first fragrance house, I think of citrus. Many of the early scents in the Miller Harris stable were delightfully juicy songs of citrus fruits, and Cologne certainly brings a lot of juice to the table. There’s a lot of top notch bigarade orange here, giving a pithy, technicolor effect atop a sea of vegetal greenery, most notably a novel asparagus note (gained through the use of isobutyl quinolone), that contrasts things rather nicely. Cologne also boasts a refreshing minty quality up top and a floral, musky base, both of which make for an experience that is hard not to breath in and enjoy. Rose fragrances are a dime-a-dozen these days (check out my Guide to Rose for proof) so it takes something for a rose-based fragrance to make a statement amongst the din. Perfumer H’s Rose doesn’t quite make a bold announcement, but it does stand out as a sharp, crackly rose with a brooding attitude. Where many roses are bright red, Rose is a vivid magenta incarnation of the flower, all sharp and sour, with a dusting of black pepper on top and a blanket of tightly woven patchouli underneath. Delightful. Velvet sits somewhere comfortably between the respective worlds of chypre and woods. It’s an iris-centric perfume that has all of the rooty, carrot-like nuances of orris root, but these facets are shrouded by a fluffy bed of labdanum and patchouli. It’s definitely the most unusual fragrance in the collection and it has an ethereal presence that feels utterly modern, without being confrontational, weird or challenging. Velvet is exactly what the name suggests: a velvety fragrance with a plush and refined texture. With a name like ‘Heliotrope‘ one expects Perfumer H’s current oriental fragrance to be nothing more than an ethereal wisp of a scent. Well, I can reassure you that this is far from the truth and whilst Heliotrope may not be a full-bodied and red-blooded oriental in the manner of, say Shalimar, it is a warm and enveloping fragrance with a unique twist. Heliotrope is a comforting iris and almond scent with a lavish base of vanilla and musk. It is sweet, but softly so and it presents, in Lyn Harris’ inimitable style, an entirely different kind of oriental: an exotic fragrance that whispers softly in one’s ear, rather than one that robustly bellows with bold spices and resins. From the current collection, Leather is my favourite. It’s also the fragrance I’ve spent the most time with. So often, leather fragrances are so rich in birch tar and quinoline that they become harsh or cloying with time (admittedly, my ‘cloying ceiling’ when it comes to leather isn’t particularly high). 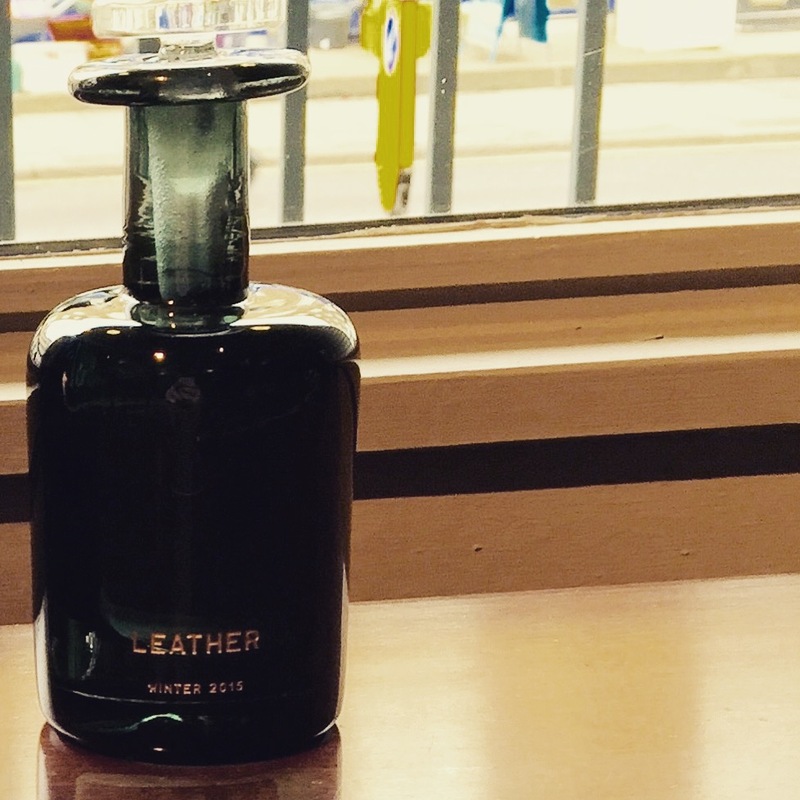 Perfumer H’s Leather however, is much more supple and soft than most, perhaps due to the fact that it is in fact, a contemporary take on the fougére, the masculine staple of perfumery (a style that Harris is fond of and we speak about, lamenting its demise since the ’80s). Leather is a suave blend of fizzy early grey tea, soft, iris-accented grey suede and creamy amber, that is as understated as it is handsome, and as versatile as it is genderless. I love it. Each fragrance in the collection can be bought individually in 100ml size, housed within one of Perfumer H’s stunning handblown glass bottles for £195. Two 10ml refillable travel sprays and a funnel are also included for those that like to spray (count me firmly in that camp), and the whole package is neatly placed in a handsome gift box shaded in a lovely hue of duck egg blue. For the personal touch, bottles and boxes can be engraved (or monogrammed in the case of the boxes) with the initials of the customer’s choosing. As far as presentation goes, Perfumer H somehow manages to go for meticulous yet effortless all at the same time. The collection has been created with a degree of flexibility and as it is refreshed seasonally, some fragrances will move into the back catalogue, which is called the Laboratory Collection, to make room for brand new perfumes, where they will be available for top-ups (£250 a pop, incl. 100ml bottle & two 7.5ml travel sprays, and funnel) for those that become addicted. Others may stay within the main collection for a bit longer and the fragrant families will not be tied to any particular coloured bottle, allowing for the right flacon to reflect the spirit of the scent. What’s more, if a customer particularly likes a particular scent in the Laboratory Collection they can purchase the formula from £2,000, meaning that it will become exclusively their perfume and will not be sold to anyone else. I should also mention that there are a number of scented candles on offer too, each of which is housed within a satisfyingly heavy hand-blown glass jar and is available for £95 for 300g. Much like the seasonal collection of fragrance, the candles are grouped by family and include; Marmalade (citrus), Ivy (floral), Fern (wood), Smoke (oriental) and Dandelion (green). My favourite was the fresh, yet slightly bitter and definitely jammy orange of Marmalade, which lives up to its namesake but with just enough abstraction for it to be suitable as an functional home fragrance. I could also be tempted by Frankincense (£110/300g), the candle created for Christmas 2015 that smoulders with silvery incense, cedar and sandalwood. It’s difficult to choose. 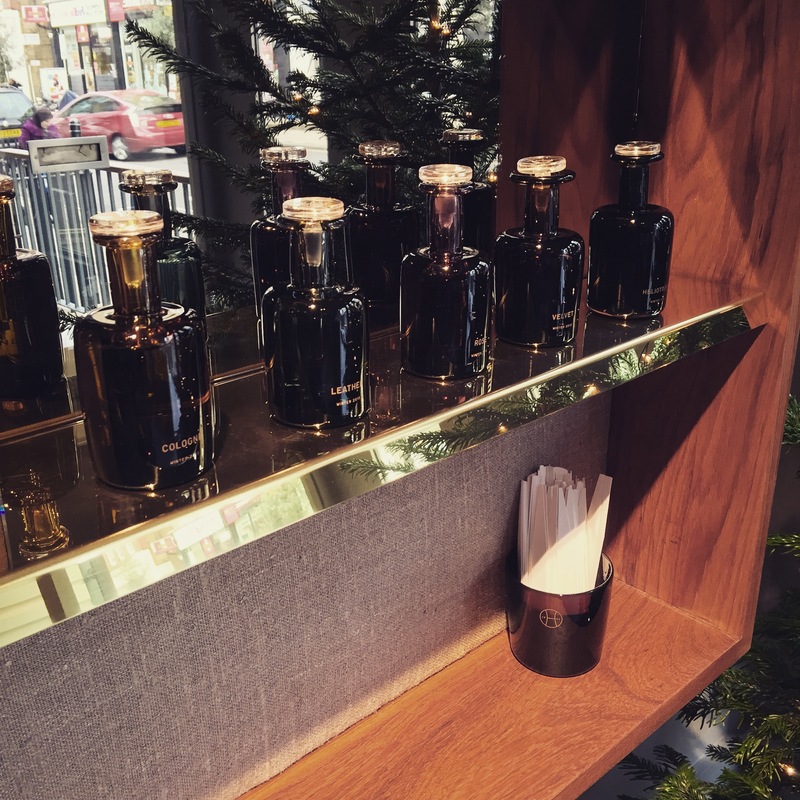 In addition to its seasonal collection and back catalogue of fragrances, which are very much expressions of Lyn Harris’ personality, Perfumer H also offers a bespoke service where clients can meet with the perfumer to create a fragrance that reflects the wearers “unique life, style and personality”. Each bespoke fragrance is housed within the signature Perfumer H bottle in the colour of the client’s choice (along with two x 7.5ml travel sprays and a funnel) with prices starting at £15,000 and refills available from £200. Hey, bespoke perfumery has never been cheap but if you’ve got the money and you love fragrance, it’s a no-brainer. Perfumer H isn’t a brand that will be for everyone. In fact, I hesitate to call it a ‘brand’ because it really doesn’t feel calculated and corporate enough to be one. Perfumer H simply is Lyn Harris. It’s an extension of her personality and her style as a perfumer. It is a relaxed atelier where scent enthusiasts can come to sample, and buy the latest creation for that season, or to snag up a perfume from a previous collection to keep entirely for themselves. 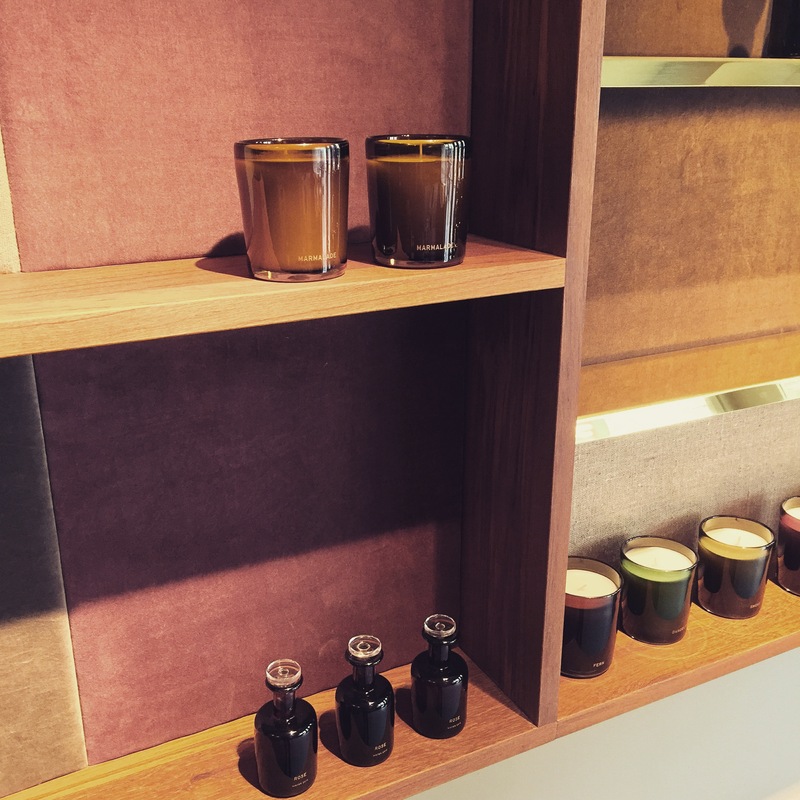 It’s also a place where a client can come to craft a bespoke perfume that bottles their personality in liquid form. 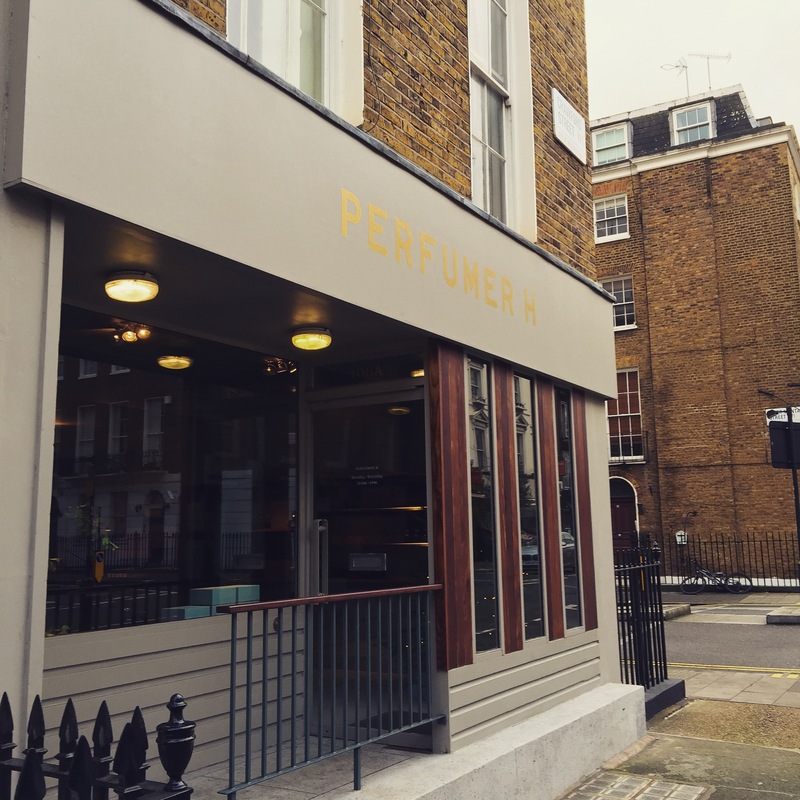 Perfumer H is a relaxed place where fanfare and pretence are not welcome. It’s a place where scent matters and where craftsmanship, whether it be in the form of beautiful bottle or an exquisite fragrance, is of utmost importance. Most strikingly though, Perfumer H is not set in stone. It is what it is now and what it is today, may not be what it is tomorrow. The excitement comes from seeing where it goes. I know that I, for one, will be watching with interest. Sample of Leather via Perfumer H. Images are my own. Posted in Article, Perfumer H and tagged Bespoke, Bespoke Fragrance, Citrus, Cologne, Dandelion, Fern, Floral, Fougère, Fragrance, Frankincense, Green, Heliotrope, Ivy, Laboratory, Leather, Lyn Harris, Marmalade, Miller Harris, Oriental, Perfume, Perfumer H, Rose, Scented Candle, Seasonal, Smoke, Velvet, Wood. Bookmark the permalink. Nice write-up! I am now lusting over Heliotrope and Velvet but since they are only available in 100 mLs, I probably will just glance at the bottles. I wish she would do a mini coffret of the collection. A mini coffret would be lovely. I’d happily opt for Velvet and Heliotrope too! I walked by before the opening and it made me curious – thanks for telling. I will have to pop in when back in London in January ! Very interesting article. Bursting with information and facts, written with respect and thoughtful interest. I’m ashamed to admit I knew nothing of Lyn Harris (apart from Miller Harris) before reading this. Please forgive my ignorance Lyn. However I’m loving this whole idea. I find Lyn’s ‘open plan’, ‘open mind’ and ‘open door’ concept exciting and inspiring. Of course there’s the scent discovery to be had too. I can’t wait to pay a visit to Perfumer H. Guess what? I’ve also got those butterflies now. How exciting. Thank you for writing and sharing this. Thank you, Adrian. It’s the open door concept that I love too. Also the fact that it all seemed to come together so organically. Definitely a brand to watch! Sounds terrific! I am so smitten by the sound of the Heliotrope! Oh….and the Velvet, and the Rose and and and……. This is exactly my predicament! Went based on this article to Perfumer H, met Lynn and her wonderful assistant Caroline. Great place and bought the amazing perfume Smoke alongside this gorgeous bottle. Thanks Thomas, without this article I wouldn’t have know the existence of Perfumer H.
Ahhh I’m so glad! It’s a great brand.